Here's the boss - You won't find him in the office though. 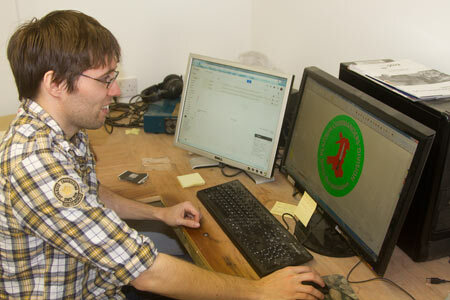 He is one of the main designers specialising in the stone and vinyl signage. 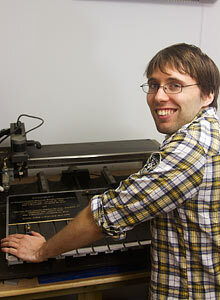 He is also the CNC programmer and senior vinyl applicator. 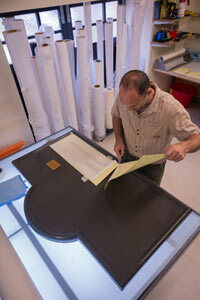 In addition he is constantly developing different signage researching new techniques and finding new materials. 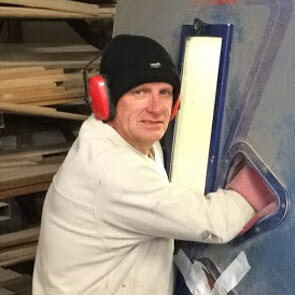 Paul is the senior carpenter All our different timber comes to us as raw wood planks. 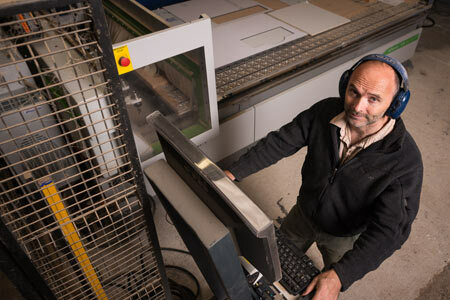 Paul must first select a suitable plank, plane it down to a smooth finish and then create the sign blank ready for engraving. He also makes the posts, memory crosses, frames for signs, backing boards and anything else made in wood! Jake is another of our main designers. He specialises in the vinyl signage. He is also the chief engraver. He crafts all kind of plaques in many different materials. 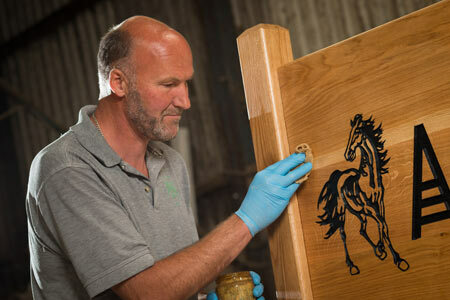 Some are deep engraved in the traditional way, others are laser engraved to give fine detail. Matt is started his career as a painter decorator. Now he works for The Sign Maker and spends much of his time in the spray room. He has had to learn about using all the different paints we use and all the different spraying methods. 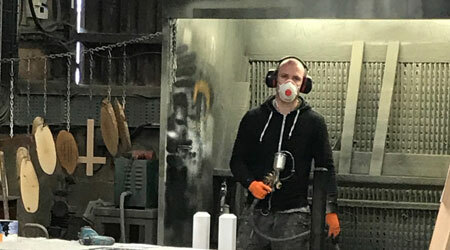 He is also helps out with sand blasting and processing stone signage, plus helps with packing. 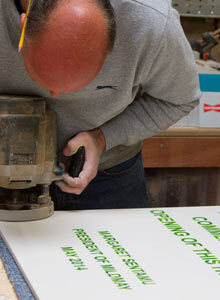 Graham sand-blasts the lettering into the slate and granite signs as well as hand painting lettering and packing parcels. He also makes an excellent job of keeping the workshops clean and tidy. 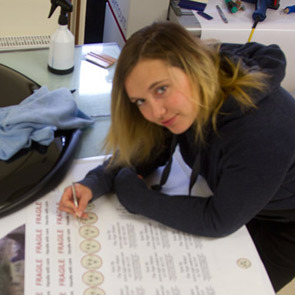 Anna is in charge of the vinyl department making wheel covers, sign boards, hanging signs and all other signage which uses cut vinyl lettering or printed vinyl. She is a very competent vinyl applicator. 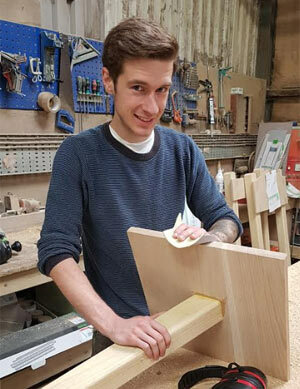 Matthew is our Apprentice Carpenter and is learning all aspects of the wood workshop from our senior carpenter Paul. Matthew spends three days on site with us and two days a week training at Petroc College. We have a lovely team in our offices, who will do their very best to pass your requirements on to the designers and sign makers. Every sign is different - size, shape, material, fonts and images can all change - there are literally thousands of options! The office staff can help you choose the most best material, send you links to appropriate pages on the website, generate quotes, take orders and arrange proofs. They work on a flexible system, with different people working on different days. If you would like a particular person to call you, just email them with your phone number and they will give you a ring. 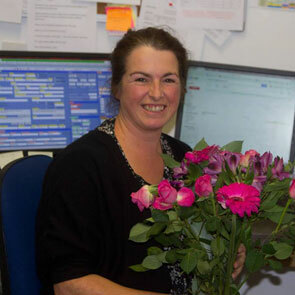 Kate has the responsibility of the general running of the business with all that it entails. Clare is the Office Manager. If on the rare occasion you should encounter any problems with a sign you will more than likely speak to Clare! She supervises all our departments and can also be found in the despatch room making sure our signs pass quality control. 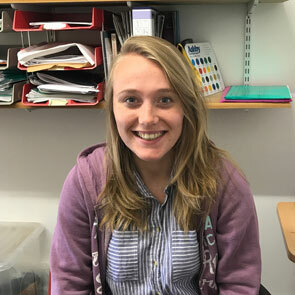 Poppy is our Assistant Office Manager, currently studying business management at Hartpury College. She assists Clare during the holidays and manages the shopping cart information and website orders. 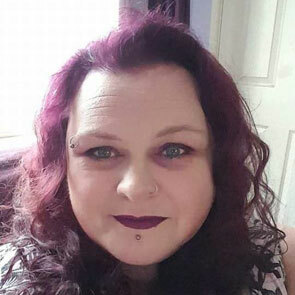 Laura has a detailed knowledge of all the signs we sell and lends a hand in all departments, writing quotes etc. She also puts the latest news up on the social media. 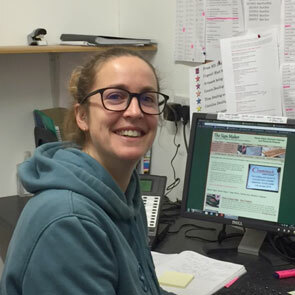 Carloine looks after our wooden sign customers, everything from large estate signage, wooden framed hanging signs to detailed wooden memorial and crosses. She also looks after the painted wooden signage. 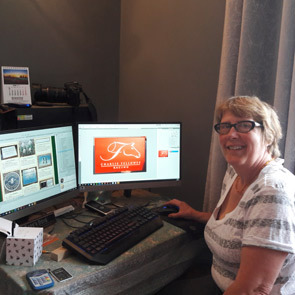 Debbie looks after our vinyl signage such as sign boards, wheel covers, hanging signs, magnetics, pub signs & notice boards. 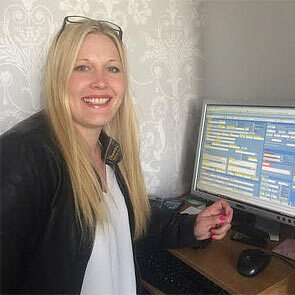 Ali is one of our Sales Assistants and is one of the first people you will speak to when you call about one of our signs, she will be able to assist you with any questions you may have and ensure that you find the right sign for your needs. 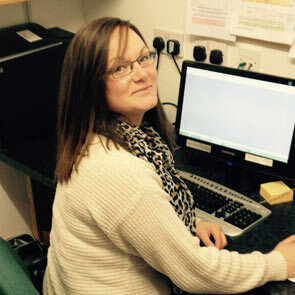 Alice looks after customers requiring slate and stone signage house signs, large signage as well as memorial plaques and stone tablets. 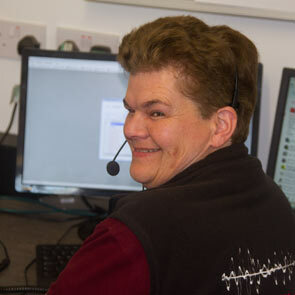 Kate is our other Sales Assistant and she will also be on the other end of the phone when you call. Advising you on what sign would be best for your requirements. 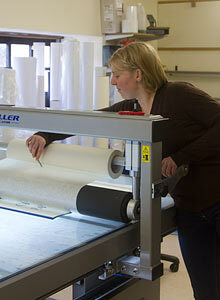 She also helps out in the packing room when needed as well as producing most of the laser engraving proofs and then engraving the signs. If you wish to email your requirements then please email either Kate or Ali our other Sales Assistant. Kate also works alongside Ali in the slate and stone department. 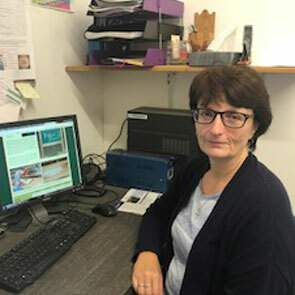 Louise who has returned to us after a few years away and is responsible for our engraved plaques and can assist you with choosing the best plaque for your situation and budget. 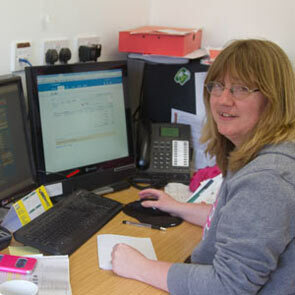 Lynne is in the accounts office and makes an excellent job of keeping all the records straight! Plus orders in alot of our stock and keeps tabs on our stock levels. She also helps out on the website and the online shopping cart. Occasionally you may also find her on the sales phone too.